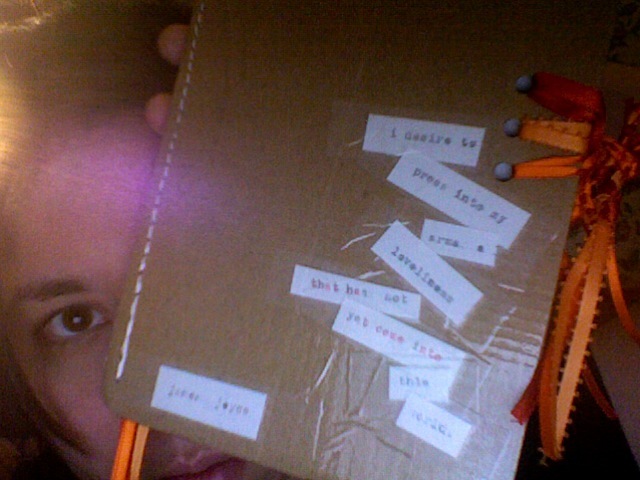 I have made myself a book. More correctly, a journal. "I desire to press into my arms a loveliness that has not yet come into this world." On the cover, my current favorite quote. I got the typewriter in my hall to work long enough to, literally, bang it out. “I desire to press into my arms a loveliness that has not yet come into this world.” How beautiful is that? It stops me every time I read it. In the last few days of the term, I re-read and re-read the final scene from Portrait. So much of that feel like my life right now. Stephen’s fears, his desires, all feel so familiar. Well, his fears about God and his desire to write. He tells Cranly “what he does not fear.” — That is exactly what I fear. Being alone. More than that, I fear mistakes. I’ve written about this before, and recently, but it’s just what’s been on my mind. Portrait and Persuasion. Granted, these are the two books I have been reading/referencing most frequently. But they feel particularly apt. In six years, I will be Anne’s age. Though I am past Stephen’s, I feel I am right in his mental space. I always wonder how and why books worm their way into my life. These two most certainly. have. …there could have been no two hearts so open, no tastes so similar, no feelings so in unison, no countenances so beloved. Now they were as strangers; nay, worse than strangers, for they could never become acquainted. It was a perpetual estrangement. How sad, to be perpetually estranged. And yet, how much I feel it, even in — actually, especially in — my own home. I feel like I am a stranger to those around me, and even to myself. Strange to those who once knew me intimately, who I trusted beyond belief, who I let know me. Now, I’m not even sure I know me. I feel so far away from acquaintance, so far away from most things formerly familiar, that I don’t even know what to do with myself. Today, I finished listening to Persuasion. I couldn’t turn it off. I know the book, love the story, but I just couldn’t leave Anne until she and Wentworth had been sufficiently reunited. Granted, my dog did not listen with me this time. 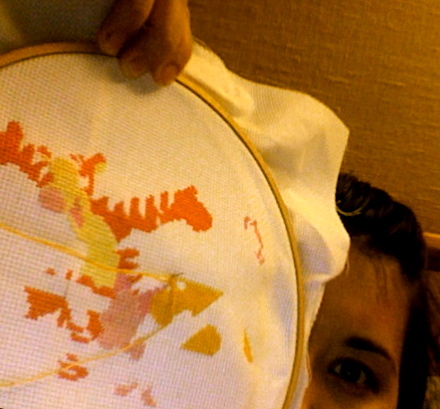 I did get a whole bunch of my cross-stitching done though. I can listen no longer in silence. I must speak to you by such means as are within my reach. You pierce my soul. I am half agony, half hope. Tell me not that I am too late, that such precious feelings are gone for ever. I offer myself to you again with a heart even more your own than when you almost broke it, eight years and a half ago. Dare not say that man forgets sooner than woman, that his love has an earlier death. I have loved none but you. Unjust I may have been, weak and resentful I have been, but never inconstant. You alone have brought me to Bath. For you alone, I think and plan. Have you not seen this? Can you fail to have understood my wishes? I had not waited even these ten days, could I have read your feelings, as I think you must have penetrated mine. I can hardly write. I am every instant hearing something which overpowers me. You sink your voice, but I can distinguish the tones of that voice when they would be lost on others. Too good, too excellent creature! You do us justice, indeed. You do believe that there is true attachment and constancy among men. Believe it to be most fervent, most undeviating, in F. W.
Had she not imagined herself consulting his good, even more than her own, she could hardly have given him up. The belief of being prudent, and self-denying, principally for his advantage, was her chief consolation, under the misery of a parting, a final parting; and every consolation was required, for she had to encounter all the additional pain of opinions, on his side, totally unconvinced and unbending, and of his feeling himself ill used by so forced a relinquishment. He had left the country in consequence. This evening, my dog and I started listening to Persuasion. He seemed to like it — he fell asleep on the bed. I sat and listened and cross-stitched to my heart’s content. I forgot both how much I love this book, and how much I enjoy this craft. First — Anne Elliot, I think life will be ok if my life (at 27) somehow reconciles itself as yours does. It’s been a few years since I read Persuasion, so I forgot how absent Anne is from the first three chapters (indicative of her family’s treatment of her) and how subtly Wentworth is introduced. Perhaps books like this shouldn’t give me an odd kind of hope, but they do. Strangely enough, I’ve realized that somewhere I both internalized and rejected the idea that if you aren’t betrothed by nineteen, you’re an old maid. 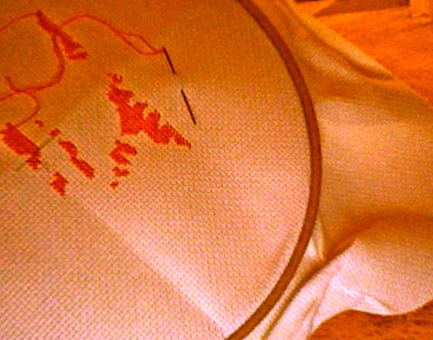 Second — I’ve never completed a perfect cross-stitch. I mess something up, inevitably. I miscount. I skip a stitch. I get so impatient that I can’t finish. Now, I’ve got 5 kits lying around my room, waiting to be completed and sewn into a pillowcase. I’m having a need to make pillowcases. Pillowcases and quilts. I wouldn’t begin to have enough beds for the pillowcases and quilts I want to make. Anyways, I paused at chapter 4 to get a drink, and because I was struck by Anne’s recollection of Wentworth. So simple. So straightforward. So much like how I’ve felt so often in my life. Before I started chapter 5, I realized my dog had wandered off. I called him: “Bungee! Come back! We have more of Persuasion to listen to!” In he trotted and waited to be lifted onto the bed. Once he got settled, paws tucked underneath him, we began.